As the candidate of the newly-formed Justice Party, Rocky Anderson is running for the office of the Presidency of the United States of America in 2012. Rocky served as mayor of Salt Lake City, Utah for eight years (between 2000 and 2008). Anderson recently left the Democratic Party after being convinced that "It is a gutless, unprincipled party, bought and paid for by the same interests that buy and pay for the Republican Party." Rocky is scheduled to appear in a live interview on Tuesday, May 29th, at 4:00 PM ET. If you missed the interview on May 29th, you can watch it and view a transcript on The Barefoot Accountant's tax-political blog: Barefoot Accountant’s Exclusive Interview of Rocky Anderson, Presidential Candidate of the Justice Party, on May 29, 2012: Video and Transcript. Chris Shays is the former Republican member of the United States House of Representatives from the 4th District of Connecticut. 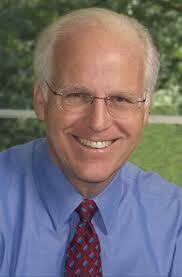 He served in Congress from 1987 until 2009. Shays is currently challenging Linda McMahon in a primary to run as the Republican nominee for the U.S. Senate seat to be vacated by retiring Connecticut senator Joe Lieberman. Chris co-chaired the Commission on Wartime Contracting, responsible for discovering $60 billion of waste, fraud, and abuse in wartime contracting. Chris is scheduled to appear in a live interview on Friday, June 1st, at 11:30 AM ET. Please submit questions and comments via the chat box provided above. Or call in at (860) 828-3269. 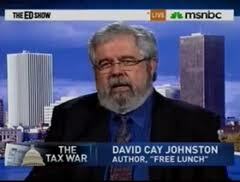 David Cay Johnston, investigative journalist and author, won the 2001 Pulitzer Prize for enterprise reporting that uncovered loopholes and inequities in the U.S. tax code. A 13-year veteran of The New York Times, he is the author of best-selling books on tax and economic policy, including Free Lunch: How the Wealthiest Americans Enrich Themselves at Government Expense and Stick You With The Bill, and Perfectly Legal: The Covert Campaign to Rig Our Tax System to Benefit the Super Rich—and Cheat Everybody Else. David will be interviewed on Wednesday, June 6th, at 1:00 PM ET to discuss his latest book, The Fine Print: How Big Companies Abuse "Plain English" and Other Tricks to Rob You Blind, to be published in September. 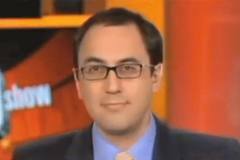 Adam Green is the co-founder of the Bold Progressives organization. Previous to that, Adam served as interim CEO of Change Congress—a reform group formed by Harvard Professor Lawrence Lessig to reform congressional elections and special-interest influence on Congress—and the Director of Civic Communications as well as Strategic Campaigns for MoveOn.org. Rob Nance is presently the curator and chief content manager of "iShade: The Accounting Profession Online" website. Previously Rob Nance was the publisher of AccountingWEB, a Sift Media publication. I am forever indebted to Rob Nance for introducing me into the world of accounting blogging. Gail Perry is Editor-in-Chief at Sift Media US, Inc., and oversees the content on AccountingWEB.com and GoingConcern.com. She also speaks at many accounting events, trade shows, and webinars. Perry is the author of 30 books including Mint.com For Dummies, The Complete Idiot's Guide to Doing Your Income Taxes, and Surviving Financial Downsizing: A Practical Guide to Living Well on Less Income. Follow the Barefoot Accountant's political-tax blog: "The Barefoot Accountant on Accounting, Taxes, QuickBooks, and U.S. Politics." If and only to the extent that this publication contains contributions from tax professionals who are subject to the rules of professional conduct set forth in Circular 230, as promulgated by the United States Department of the Treasury, the publisher, on behalf of those contributors, hereby states that any U.S. federal tax advice that is contained in such contributions was not intended or written to be used by any taxpayer for the purpose of avoiding penalties that may be imposed on the taxpayer by the Internal Revenue Service, and it cannot be used by any taxpayer for such purpose. The above tax advice was written to support the promotion or marketing of the accounting practice of the publisher and any transaction described herein. The taxpayer recipients of this offering memorandum should seek tax advice based on their particular circumstances from an independent tax advisor . Want Free Market Data of Competitors? Need Quickbooks Training or Support? Have You Chosen the Correct Tax Method? Don't Want to Pay those IRS Penalties? Loss on Sale of Home? Is Renting Tax Smart? Supreme Court Justice George Sutherland: "The legal right of a taxpayer to decrease the amount of what otherwise would be his taxes, by means which the law permits, cannot be doubted." British Chancellor of the Exchequer Denis Healy: "The difference between tax avoidance and tax evasion is the thickness of a prison wall." Compare our fees to those of other accountants and save thousands of dollars every year in accounting fees! Albert Einstein: "The hardest thing in the world to understand is income tax."